The NF-AT family is a group of potent transcription factors that are essential for T cell activation in vitro. However, NF-ATc2-deficient Th cells display hyperproliferation in response to stimulation, suggesting that NF-ATc2 functions as a negative regulator of Th cell activation/proliferation. In this study we show that the transcriptional repressor of GATA (ROG) is a direct target gene of NF-ATc2 and that NF-ATc2-deficient Th cells are unable to fully up-regulate ROG upon stimulation. Restoration of ROG expression in vivo partly corrects the hyperproliferation of NF-ATc2-deficient Th cells by attenuating TCR signals. Our data, therefore, depict a ROG-mediated negative feedback mechanism of T cell activation. One group of proteins that plays a critical role in relaying activating signals from Ag receptor to the nucleus in T cells is the NF-AT family of transcriptional factors. To date, at least four NF-AT members, NF-ATc1 (NF-ATc or NF-AT2), NF-ATc2 (NF-ATp or NF-AT1), NF-ATc3 (NF-AT4 or NF-ATx), and NF-ATc4 (NF-AT3), have been cloned (1). Each NF-AT member contains an NF-AT homology region that defines the NF-AT family, a DNA-binding domain, and one or two trans-activation domains. With the exception of NF-ATc4, transcripts of all NF-AT members can be detected in T cells (2), and the expression of NF-ATc1 can be further induced by stimulation with anti-CD3 (3). However, the activities of NF-AT proteins are primarily regulated by their phosphorylation status and subcellular localization (1). Once T cells are stimulated with Ags, NF-AT proteins are rapidly dephosphorylated and translocated into the nucleus. The dephosphorylation and nuclear import of NF-AT are mediated by calcineurin (4, 5, 6, 7), which is activated by calcium signaling pathways and inhibited by immunosuppressants, such as cyclosporin A (CsA)5 and FK506 (8). In many in vitro systems, inhibition of NF-AT activity by CsA or FK506 profoundly inhibited T cell activation. The critical roles of NF-AT proteins in the immune system were best demonstrated by recent studies of mice made deficient in various NF-AT family members. Recombinase-activating gene−/− mice reconstituted with NF-ATc1−/− embryonic stem cells displayed defects in lymphoid repopulation and IL-4-driven responses (9, 10), whereas NF-ATc3-deficient (C3KO) mice have minor defects in T cell development but normal cytokine production (11). Unexpectedly, Th cells derived from NF-ATc2-deficient (C2KO) mice displayed anti-CD3-induced hyperproliferation and overproduction of IL-4 and were more resistant to activation-induced cell death (12, 13). Most strikingly, mice rendered deficient in both NF-ATc2 and NF-ATc3 (DKO mice) developed a severe lymphoproliferative disorder, and DKO Th cells spontaneously developed into Th2 cells producing high levels of Th2 cytokines (3). These studies, however, raise an important question: how do NF-ATc2 and NF-ATc3, potent transcriptional activators in vitro, serve as negative regulators of Th cell activation in vivo? The answer to this question has remained elusive. Repressor of GATA (ROG), a new member of the poxviruses and zinc finger family of transcriptional repressors, was initially cloned as a GATA-3-interacting protein (14). Resting T cells express ROG at a very low level, which is rapidly induced, within 4–6 h, upon stimulation. In vitro, ROG can serve as a GATA-3-dependent transcriptional repressor, but unlike GATA-3, which is a Th2 cell-specific transcription factor, ROG transcripts can be detected in both Th1 and Th2 cells. These observations suggest that ROG might play a role in T cell activation in addition to serving as a GATA-3-dependent transcriptional repressor. In this study we present evidence demonstrating that ROG is a critical part of a NF-ATc2-initiated negative feedback mechanism of T cell activation. Our data also provide an attractive explanation for the negative regulatory function of NF-ATc2 protein. EL4 (a murine thymoma cell line) cells were maintained in RPMI 1640 culture medium supplemented with 10% FCS. Transfection of EL4 cells was performed by electroporation as described previously (15). For cotransfection experiments, 5 μg of each ROG promoter reporter construct, in the backbone of pGL2-Basic (Promega, Madison, WI), and 5 μg of a NF-ATc2 expression vector, pEFBOS-NF-ATc2 (a gift from Dr. A. Rao, Harvard Medical School, Boston, MA), were used. In addition, 10 ng of a Renilla luciferase reporter vector, pRL-TK (Promega), was added to each transfection as an internal control for transfection efficiency. The transfected cells were left untreated or were treated 1 h after transfection with PMA (50 ng/ml), ionomycin (iono; 1 μM), and CsA (1 μg/ml), either alone or in combination. Twenty-four hours after transfection, cell extract was harvested and subjected to luciferase assay with the Dual Luciferase Reporter System (Promega) according to the manufacturer’s instructions. The firefly luciferase activity thus obtained was normalized against the Renilla luciferase activity of the same sample. To generate ROG transgenic mice, a 1.6-kb, full-length, murine ROG cDNA was cloned into the SalI site of the p37.1 vector (gift from Dr. D. Littman, New York University Medical School, New York, NY), which contains the CD4 promoter/enhancer and the first intron without the silencer element. The resulting construct was injected into pronuclei derived from ICR mice. ROG transgenic founders were identified by digesting genomic DNA with SalI, followed by Southern analysis using the full-length ROG cDNA as a probe. The founders were crossed with BALB/c mice, and subsequent screening of ROG transgenic mice was conducted by genomic PCR using the following primers: 5′-GCCCTGGGGAAAAGATCCTG-3′ and 5′-ATCTTGTTGTGGCCCTCCAG-3′. The C2KO, C3KO, and DKO mice used in Fig. 1⇓ were in the BALB/c genetic background and were provided by Dr. L. Glimcher (Harvard School of Public Health, Boston, MA). The C2KO, C2KO/TG, DKO, and DKO/TG mice used in Figs. 5–7⇓⇓⇓ were offspring of intercrosses between (BALB/c × ICR)F1. Expression of ROG in T cells. EL4 cells (A, right panel) and normal effector Th2 cells obtained by in vitro differentiation from BALB/c (left panel of A and WT in B), C2KO, C3KO, and DKO mice (B) were left unstimulated (−) or were stimulated with PMA/iono or anti-CD3 (1 μg/ml) in the presence or the absence of CsA (1 μg/ml) for 6 h. The levels of ROG or γ-actin transcript were analyzed by Northern analysis. 28S ribosomal RNA is also shown as the loading control. The murine ROG cDNA probe used is a 200-bp SmaI restriction fragment. CD4+ Th cells were purified from lymph nodes with MACS L3T4 Microbeads (Miltenyi Biotec, Auburn, CA) and stimulated in vitro with soluble anti-CD28 (1 μg/ml) and plate-bound anti-CD3ε mAb (2C11) at 1 μg/ml (nonskewing conditions) along with anti-IL-12 mAb (5C3) at 20 μg/ml (Th2 skewing conditions). Twenty-four hours poststimulation, IL-4 at 500 U/ml (for Th2 skewing conditions only) and IL-2 at 50 U/ml were added. Afterward, the stimulated cells were cultured for another 6 days before use. All Abs and cytokines were purchased from BD PharMingen (San Diego, CA). The DNase I hypersensitivity assay was described previously (16). Briefly, 10 × 107 cells of Th cells were lysed with 5 ml of cold lysis buffer (60 mM KCl, 15 mM NaCl, 5 mM MgCl2, 10 mM Tris (pH 7.4), 300 mM sucrose, 0.5 mM PMSF, and 0.1% Nonidet P-40). The nuclei were collected and resuspended in 0.7 ml of ice-cold lysis buffer (without Nonidet P-40 and PMSF). DNase I (Worthington Biochemical, Lakewood, NJ) were diluted with dilution buffer (0.1 mg/ml acetylated BSA and 1 mM CaCl2 in lysis buffer without Nonidet P-40 and PMSF) to various concentrations (from 0–24 μg/ml). One hundred microliters of the prepared nuclei was incubated with 2 μl of the diluted DNase I for 3 min at room temperature. The reaction was stopped by the addition of 550 μl of stop solution (0.3 M sodium acetate, 0.5% SDS, 5 mM EDTA, and 0.1 mg/ml proteinase K) and was further incubated at 55°C for 1 h. The genomic DNA was purified by sequential extraction with phenol, phenol/chloroform, and chloroform; precipitated in ethanol; and resuspended in 300 μl of 1× Tris-EDTA. The purified genomic DNA was digested with EcoRI/ClaI, and 20 μg of the digested DNA was fractionated in a 0.8% agarose gel and analyzed by Southern blotting. T4 polynucleotide kinase was used to end-label 100 ng of double-stranded oligonucleotides with [γ-32P]dATP (DuPont NEN, Wilmington, DE). The labeled double-stranded oligonucleotides were isolated and purified on 12% polyacrylamide gels, eluted overnight at 37°C in 1× Tris-EDTA, and precipitated in ethanol. Binding assays were performed at room temperature for 20 min using 10 μg of nuclear extract, 500 ng poly(dI-dC), and 20,000 cpm of probe in a 15-μl volume of 20 mM HEPES (pH 7.9), 100 mM KCl, 5% glycerol, 1 mM EDTA, and 5 mM DTT. For supershift assay, 1 μl of anti-NF-ATc2 mAb (4G6-G5; Santa Cruz Biotechnology, Santa Cruz, CA) or control Ig was added. For cold competition, unlabeled wild-type or mutant double-stranded oligonucleotides in 5-, 25-, and 50-fold molar excesses were added. The samples were then fractionated in 4% nondenaturing polyacrylamide gels containing 0.5× Tris-borate-EDTA at room temperature. The sequence of the wild-type oligonucleotide, corresponding to −515 to −488 of the ROG promoter, is 5′-GCTCAGAAGTGGAAAATATTTAACATTC-3′. The sequence of the mutant oligonucleotide is 5′-GCTCAGAAGTGCTCAATATTTAACATTC-3′. Th cells obtained from the spleen and lymph nodes were plated in triplicate at 104 cells/100 μl medium (containing 1 μg/ml anti-CD28)/well into a 96-well plate, which was precoated with anti-CD3 at various concentrations. After 48 h of incubation at 37°C, [3H]thymidine (1 μCi/well) was added, and the cells were cultured at 37°C for an additional 16 h before harvest. [3H]thymidine uptake was measured with a liquid scintillation counter (Amersham Pharmacia Biotech, Piscataway, NJ). Each experiment was performed in triplicate and used Th cells obtained from one mouse per genotype. Th cells (2 × 106 cells/ml) were washed, resuspended in PBS containing 5% FBS, and mixed with 5 μM CFSE (Molecular Probes, Eugene, OR) at room temperature for 8 min. The stained cells were washed twice and resuspended in culture medium before use. For each sample, 2 × 106 Th cells were resuspended in 600 μl of stimulation medium (RPMI 1640, 10 mM HEPES, 2 mM l-glutamine, and 0.2 mM vanadate). Cells were then rested or incubated with 10 μg of anti-CD3ε (BD PharMingen) and 10 μg of anti-CD28 (BD PharMingen) on ice for 30 min, washed twice with cold stimulation medium, and resuspended in 600 μl of warm (37°C) stimulation medium. Cells were activated with 3 μl of anti-Armenian/Syrian hamster IgG1 (G94-56; BD PharMingen) for 4 min at 37°C on a shaker, and activation was stopped by transferring tubes to ice before the addition of 1 ml of ice-cold stimulation medium. Cells were collected by centrifugation at 5000 rpm for 3 min and lysed with 100 μl of freshly prepared radioimmunoprecipitation assay buffer (0.15 M NaCl, 0.05 M Tris (pH 7.5), 1% Triton X-100, 1% sodium deoxycholate, and 0.1% SDS) at 4°C overnight on a rocker. Cell lysate was separated from debris by centrifugation at 12,000 rpm for 10 min, mixed with 100 μl of 2× sample buffer (10% glycerol, 3% SDS, 62.5 mM Tris (pH 6.8), and 0.02% bromphenol blue), fractionated on a 9% SDS-PAGE gel, and transferred to a polyvinylidene difluoride membrane (Polyscreen; DuPont NEN). The membrane was then probed with anti-phosphotyrosine (4G10), anti-phospho-extracellular signal-regulated kinase (anti-phospho-ERK; Cell Signaling Technology, Beverly, MA), or anti-ZAP70 (Transduction Laboratories, Lexington, KY), and visualized with the ECL kit (DuPont NEN). 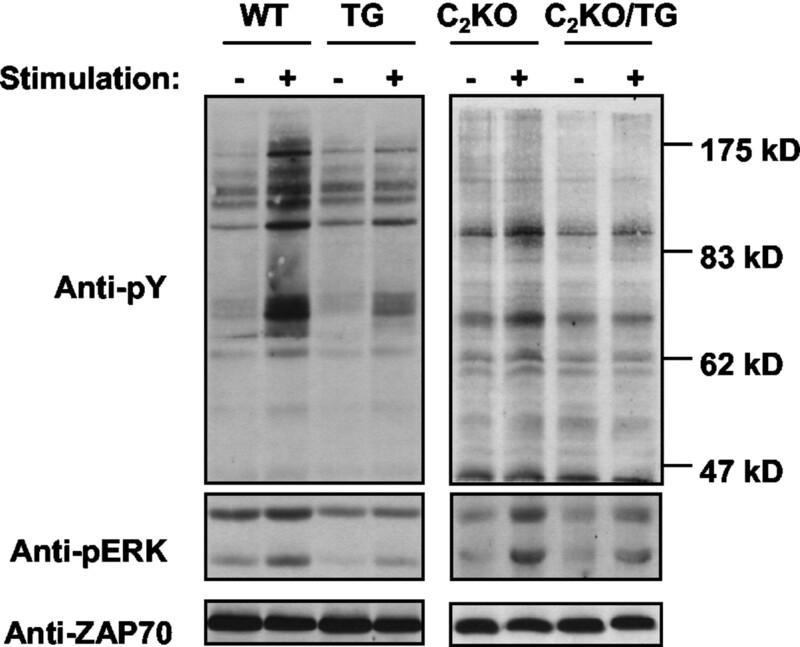 The anti-phospho-ERK Ab recognizes both ERK1 (p44) and ERK2 (p42). Previously, we have shown that ROG is rapidly induced in wild-type effector Th cells by stimulation with anti-CD3. Interestingly, this induction of ROG was inhibited by CsA (Fig. 1⇑A, left panels). Similarly, the expression of ROG in EL4 cells (murine thymoma cells) was induced by PMA/iono, and the induction was also sensitive to CsA (Fig. 1⇑A, right panels). These observations suggest that the expression of ROG may be dependent on NF-AT, a group of CsA-sensitive transcription factors. To test this hypothesis, we examined the expression of ROG in various NF-AT-deficient Th cells, obtained by in vitro differentiation from BALB/c, C2KO, C3KO, and DKO mice. Because C2KO and DKO Th cells tend to differentiate into Th2 cells even under nonskewing conditions (3, 17), we chose to cultivate Th cells under Th2-skewing conditions to avoid any confounding effect on the level of ROG transcripts caused by Th2 cytokines. Consistent with our previous results, ROG transcripts were rapidly induced in wild-type Th2 cells; however, the basal and induced levels of ROG were markedly reduced in C2KO and DKO, but not in C3KO, Th2 cells (Fig. 1⇑B). Similarly, we found that ROG transcript levels were significantly reduced in C2KO effector Th1 cells or in developing C2KO Th cells 3 days after primary stimulation under nonskewing conditions (data not shown and Fig. 5⇓A). These observations indicate that ROG is a direct or an indirect target gene of NF-ATc2. To determine whether ROG is a direct or an indirect target gene of NF-ATc2, we identified and cloned the murine ROG promoter. We first performed a 5′ RACE to obtain the most 5′ end of the ROG cDNA. The longest cDNA clone thus obtained contained ∼1 kb of 5′-untranslated region. Using the 5′-untranslated region as probe to screen a murine genomic library, we isolated several genomic clones encompassing the murine ROG gene and its flanking regions. Sequence analysis showed that the full-length ROG cDNA is derived from six exons (Fig. 2⇓A). The putative first exon contains nearly all the 5′-untranslated region, and a consensus TATA box is located ∼17 bp upstream of the putative first exon. Identification and cloning of the ROG promoter. A, A schematic diagram of the murine ROG gene. □, Untranslated exons; ▪, translated exons. The exons are numbered with Arabic numerals. Bam and ClaI, restriction sites BamHI and ClaI. B, DNase I hypersensitivity analysis of the murine ROG gene. Genomic DNA was prepared from DNase I-treated, unstimulated (−) or anti-CD3 stimulated (+; 1 μg/ml for 6 h) Th cells obtained by in vitro differentiation under nonskewing conditions, digested with EcoRI/ClaI, and subjected to Southern analysis using a genomic probe shown in A. C, Luciferase assays of the ROG promoter activity. The 3.5-kb BamHI restriction fragment (as shown in A), in either 5′ to 3′ or 3′ to 5′ orientation, and a truncated fragment (−1425 to +71) were respectively cloned into the pGL2-Basic luciferase reporter. The resulting reporter constructs were used to transfect EL4 cells. The data in the top panel represent the fold increase in luciferase activity over that obtained from the pGL2-Basic in resting cells, arbitrarily set at 1. In the bottom panel, the result shown is the fold increase in luciferase activity after various treatments compared with the activity obtained under untreated conditions (rest), arbitrarily set at 1. The data shown are the average of at least three independent experiments. P+I, PMA and iono. The sequences of the ROG promoter are available from GenBank under accession number AF335542. To identify cis-acting elements regulating the expression of ROG in Th cells, we chose to perform DNase I hypersensitivity assays on the murine ROG gene. BALB/c Th cells were left unstimulated or were stimulated with anti-CD3 for 24 h before treatment with DNase I. Genomic DNA was purified from the DNase I-treated cells and subjected to Southern analysis. As shown in Fig. 2⇑B, two DNase I hypersensitivity sites (DHSs) were barely appreciated in unstimulated samples when a 700-bp probe (see Fig. 2⇑A), immediately upstream from the ClaI site, was used. The first site, DHSI, is ∼2.5 kb upstream from the ClaI site and falls in the first intron, whereas the second site, DHSII, ∼4.4 kb upstream to the ClaI site, corresponds to the putative promoter region of the ROG gene. Both DHSs were modestly accentuated in the anti-CD3-stimulated samples, suggesting that both DHSs may contain critical cis-acting elements. To examine whether the consensus TATA box sequence upstream of the putative first exon can function as a promoter, we cloned a 3.5-kb BamHI restriction fragment (see Fig. 2⇑A), encompassing DHSI, DHSII, and the consensus TATA box, into the pGL2-Basic luciferase reporter vector in both orientations. The resulting reporter constructs were used to transfect EL4 cells, which were subsequently treated with PMA/iono alone or in combination with CsA. EL4 cells were chosen because they are easily transfectable and also because the expression kinetics of ROG in EL4 are very similar to those in normal Th cells (Fig. 1⇑A). As shown in Fig. 2⇑C, the 3.5-kb fragment, in a 5′ to 3′ orientation, yielded a modest basal level of luciferase activity compared with empty pGL2-Basic. The transcriptional activity of the 3.5-kb fragment was further induced by ∼25- to 30-fold in response to PMA/iono, whereas the PMA/iono-induced activities were sharply reduced by CsA. In contrast, the 3.5-kb fragment was transcriptionally inactive in a 3′ to 5′ orientation (Fig. 2⇑C, top panel). This result strongly indicates that the 3.5-kb fragment, containing potent promoter activity, precisely reflects the expression kinetics of the endogenous ROG gene in T cells. We henceforth designated the first base pair of the first exon as +1. Furthermore, a smaller genomic fragment (−1425 to +71, henceforth called the proximal ROG promoter), containing only the DHSII, still retained ∼50% of the promoter activity and was sufficient to confer the induction by PMA/iono (Fig. 2⇑C, bottom panel). Nevertheless, this result argues that optimal PMA/iono-induced promoter activity requires both DHSI and DHSII. Sequence analysis revealed that the proximal ROG promoter contains at least four potential NF-AT binding sites at −854, −685, −508, and −456 positions, respectively (Fig. 3⇓A), suggesting that NF-AT proteins might trans-activate the proximal ROG promoter by directly binding to these potential NF-AT sites. To test this hypothesis, EL4 cells were cotransfected with the proximal ROG promoter reporter construct along with a NF-ATc2 expression vector or a control vector and stimulated with PMA/iono. Indeed, overexpression of NF-ATc2 further enhanced the PMA/iono-induced promoter activity by ∼10-fold (Fig. 3⇓B). To further identify functionally critical NF-AT binding sites within the proximal ROG promoter, we generated a series of truncation mutants of the proximal ROG promoter. A deletion mutant (−547 to +71) that contains both the −508 and −456 potential NF-AT sites was still responsive to NF-ATc2, whereas further deletion of the −508 potential NF-AT site (−478 to +71) reduced NF-ATc2-induced trans-activation by ∼70% (Fig. 3⇓B). 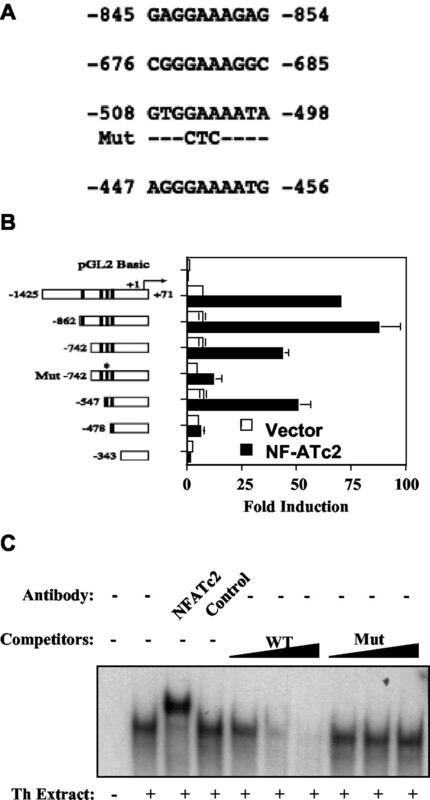 In agreement with the deletion analysis, mutation of the −508 NF-AT site in the context of −742 to +71 promoter also markedly reduced NF-ATc2-induced trans-activation (Fig. 3⇓B, Mut −742 to +71). Trans-activation of the ROG promoter by NF-ATc2. A, Sequences of the potential NF-AT sites in the proximal ROG promoter. Mut is the altered −508 NF-AT site sequence that was used in B and C. B, Luciferase assays of the wild-type and mutant proximal ROG promoters. The left panel is a schematic diagram of the wild-type and mutant proximal ROG promoters. ▪, Potential NF-AT sites listed in A. ∗, Altered −508 NF-AT site. The indicated proximal ROG promoter reporter constructs along with an NF-ATc2 expression vector (▪) or the corresponding empty pEFBOS (vector; □) were used to transfect EL4 cells. The transfected cells were then stimulated with PMA/iono. The result shown is the fold increase in luciferase activity over that obtained from the pGL2-Basic/pEFBOS transfected sample. The data shown are the average of at least three independent experiments. C, EMSA analysis of the −508 NF-AT site. EMSA was performed using the −508 NF-AT site in the presence or the absence of indicated Abs or escalating amounts of cold competitors. WT and Mut, unlabeled wild-type and altered −515 to −488 double-stranded oligonucleotides, respectively. Nuclear extract was prepared from BALB/c Th cells obtained by in vitro differentiation under nonskewing conditions and restimulated with anti-CD3 (1 μg/ml) for 6 h before harvest. To determine whether endogenous NF-AT proteins can bind to the −508 NF-AT site, we performed EMSA using nuclear extract prepared from wild-type Th cells. As shown in Fig. 3⇑C, one nuclear protein complex bound to the −508 NF-AT site. The migration of the complex was further retarded by an anti-NF-ATc2 Ab (4G6-G5; Santa Cruz Biotechnology), which is not cross-reactive to other NF-AT proteins, but not by a control Ab. In addition, formation of the complex was precluded by excessive amounts of unlabeled wild-type probes, but not by excessive amounts of an unlabeled mutant probe bearing point mutations in the −508 NF-AT binding site. Taken together, these results demonstrate that the −508 NF-AT site is functionally critical in mediating NF-ATc2-induced trans-activation of the proximal ROG promoter and that ROG is a direct downstream target of NF-ATc2. Of note, the position of the −508 NF-AT site correlates very well with the location of DHSII. To further study the function of ROG in Th cells, we generated transgenic mice expressing a ROG transgene under the control of a silencerless CD4 promoter (Fig. 4⇓A), which supports the expression of a transgene in a T cell-specific manner. Two independent founder lines (3454 and 3449) carrying the ROG transgene were generated (Fig. 4⇓B). Line 3454 appears to carry more copies of the ROG transgene than line 3449. However, the level of ROG transcripts in Th cells 3 days after primary stimulation was only modestly increased in the 3454 line when examined by Northern analysis (Fig. 4⇓C) and was marginally enhanced in the 3449 line as detected by real-time PCR (data not shown). The subtle increase may be partly due to an already high level of endogenous ROG transcripts. Offspring of both transgenic lines were born at the expected Mendelian ratio and were developmentally normal up to 2 mo of age. Their peripheral T and B cell numbers were comparable to those of wild-type nontransgenic littermates, and there was no obvious difference in the expression of various T cell surface markers (data not shown). However, the uptake of [3H]thymidine by 3454 Th cells in response to stimulation was modestly, but reproducibly, reduced compared with that by wild-type Th cells, whereas 3449 Th cells did not exhibit any defect in [3H]thymidine uptake (Fig. 4⇓D). Previously we have reported that overexpression of ROG suppressed the production of cytokines in Th clones. However, Th cells derived from both transgenic lines had no defect in the production of Th1 and Th2 cytokines (data not shown). Generation and analyses of ROG transgenic mice. A, A schematic diagram of the ROG transgene. B, Genomic DNA was prepared from Th cells derived from TG mice and respective control littermates (WT). The presence of the ROG transgene was detected by genomic PCR (top panel) and Southern blotting (bottom panel) as described in Materials and Methods. C and D, Th cells obtained from wild-type and transgenic mice were stimulated with anti-CD3 (1 μg/ml in C or indicated concentration in D) and anti-CD28 (1 μg/ml) for 72 h and analyzed for ROG transcript levels by Northern analysis (C) and for [3H]thymidine uptake (D). The data shown in C are representative of two independent experiments. The data shown in D are representative of at least three independent experiments. The facts that ROG is a direct target gene of NF-ATc2 and that overexpression of ROG attenuated Th cell proliferation raise the possibility that the hyperproliferation of C2KO Th cells may be partly explained by a low level of ROG. To test this hypothesis, we introduced the ROG transgene into the C2KO genetic background (C2KO/TG mice). As shown in Fig. 5⇓A, we found that the induction of ROG was also impaired in C2KO Th cells 3 days after primary stimulation, and that the presence of the ROG transgene (line 3454) partially restored the levels of total ROG transcripts in activated C2KO Th cells, as examined by Northern analysis. We then examined the anti-CD3/anti-CD28-induced proliferative response of C2KO/TG Th cells. In agreement with the previous report, deficiency of NF-ATc2 resulted in hyperproliferation of Th cells upon stimulation (Fig. 5⇓B), as determined by [3H]thymidine uptake. Interestingly, forced expression of the ROG transgene, despite its modest effects on wild-type Th cells, substantially reduced the uptake of [3H]thymidine of C2KO Th cells, in particular at submaximal doses of anti-CD3, to a level very close to that of wild-type Th cells. Similar results were obtained from both 3454 and 3449 transgenic lines, and only the 3454 line was used in further studies. The reduced [3H]thymidine uptake was mainly attributed to attenuated proliferation, not to enhanced apoptosis. The ROG transgene substantially reduced the numbers of C2KO cells undergoing cell division (from 61 to 30%) in response to stimulation (Fig. 5⇓C), as examined by CFSE dilution assay. In agreement with previous reports, C2KO Th culture contained much fewer late apoptotic (annexin V+/PI+) cells (13% in wild-type vs 6% in C2KO). 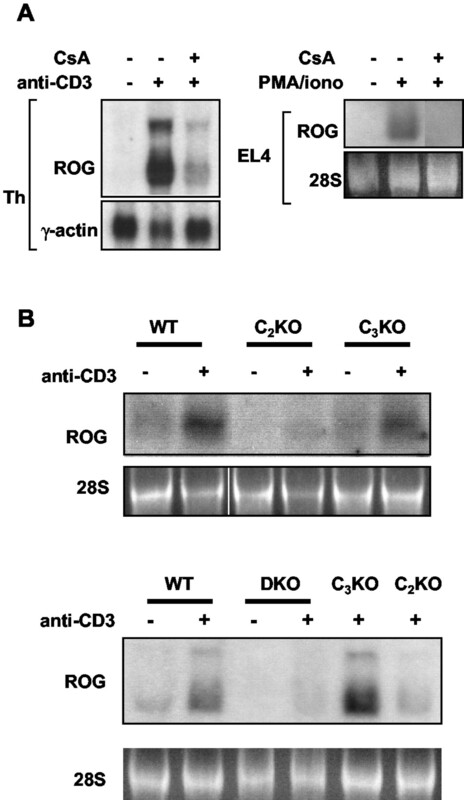 The ROG transgene did not enhance the sensitivity of C2KO Th cells to apoptosis (Fig. 5⇓D). Somewhat surprisingly, we occasionally observed that the cycling of C2KO/TG Th cells was even slower than that of wild-type Th cells (Fig. 5⇓C). However, the [3H]thymidine uptake of C2KO/TG Th cells was reproducibly higher than that of wild-type Th cells at higher doses of anti-CD3. This discrepancy may be explained by the reduced apoptosis of C2KO/TG Th cells. Although it was reported that C2KO Th cells, compared with wild-type Th cells, also produced higher levels of IL-4 upon stimulation (12, 13), we were not able to reproduce this result. The discrepancy may originate from differences in the genetic backgrounds of the C2KO mice. The C2KO mice used in previous studies are in partial 129/sv or pure BALB/c background (3, 12, 13), whereas the C2KO mice in this study are offspring of intercrosses between (BALB/c×ICR)F1. Nevertheless, we did not detect any effect of the ROG transgene on cytokine production by C2KO/TG Th cells (data not shown). Attenuation of the proliferation of C2KO Th cells by the ROG transgene. Th cells of the indicated genotypes were stimulated with anti-CD3 at 1 μg/ml (A, C, and D) or at indicated concentration (B) along with anti-CD28 (1 μg/ml) for 72 h and analyzed for total ROG transcript levels by Northern analysis (A) and for [3H]thymidine uptake (B). The data shown in A are representative of two independent experiments, and the data shown in B are representative of at least three independent experiments. The stimulated cells were also analyzed at the indicated time points for cell division by CFSE dilution (C) and apoptosis by annexin V/propidium iodide staining (D). C, The number of divisions represented by each peak is indicated, and the percentages of undivided cells (Div. 0) or cells undergoing one to three divisions (Div. 1–3) were calculated based on all live cells. The values shown in D are the percentages of cells in early (annexin V+/propidium iodide−) or late (annexin V+/propidium iodideI+) apoptosis. The data shown in B–D are representative of at least three independent experiments. DKO Th cells also exhibited marked hyperproliferation in response to stimulation and had a defect in the induction of ROG (Fig. 1⇑B). We, therefore, also introduced the ROG transgene into DKO mice. To increase the frequency of DKO and DKO/TG mice, we chose to set up mating between C2KO/NF-ATc3+/− and C2KO/NF-ATc3+/−/TG mice. Consequently, we were not able to obtain wild-type littermates as controls. Nevertheless, DKO mice spontaneously developed splenomegaly and diffuse lymphadenopathy as early as 6 wk of age, whereas DKO/TG mice of the same age had a relatively mild form of lymphoproliferation, as judged by the total cell counts of the spleen and lymph nodes (Fig. 6⇓A). Interestingly, the difference in cell numbers between DKO and DKO/TG was very negligible in a few mice that were sacrificed at 8 wk of age (data not shown), suggesting that the ROG transgene only transiently retarded the development of the lymphoproliferative disease. To further determine whether the ROG transgene can attenuate the proliferation of DKO Th cells, Th cells obtained from 6-wk-old C2KO, DKO, and DKO/TG littermates were stimulated in vitro with anti-CD3/anti-CD28 for 3 days, and the uptake of [3H]thymidine was measured. In agreement with the previous report, DKO Th cells proliferated much more robustly than C2KO Th cells (3). Provision of the ROG transgene substantially attenuated the proliferation of DKO Th cells stimulated with submaximal doses of anti-CD3. However, the inhibitory effect of the ROG transgene vanished at the maximal dose of anti-CD3 stimulation (Fig. 6⇓B). As in C2KO/TG Th cells, the ROG transgene had no effect on the overproduction of Th2 cytokines by DKO Th cells. 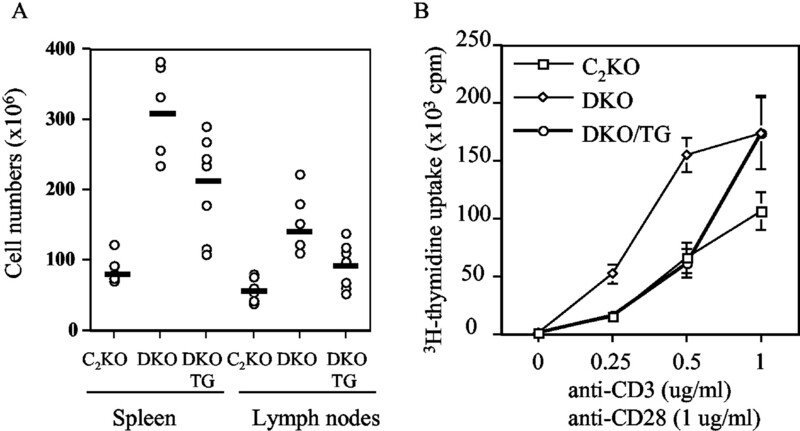 Attenuation of lymphoproliferation in DKO mice by the ROG transgene. A, C2KO, DKO, and DKO/TG mice were sacrificed at 6 wk of age, and total numbers of splenocytes and lymph node cells are reported. B, Th cells obtained from C2KO, DKO, and DKO/TG littermates were stimulated in vitro with the indicated doses of anti-CD3 and 1 μg/ml of anti-CD28 for 3 days, and the uptake of [3H]thymidine was measured. The data shown in B are representative of three independent experiments. ROG may inhibit T cell proliferation by directly suppressing the cell cycle machinery or by attenuating the activation signals downstream of the TCR. We first used gene array to examine transcript levels of several cell cycle regulators and found no substantial difference between transgenic and nontransgenic Th cells (data not shown). We then evaluated the strength of TCR signals by examining the levels of phosphotyrosine in cytoplasmic extracts on Western analysis. As shown in Fig. 7⇓, introduction of the ROG transgene to wild-type Th cells reduced the overall level of phosphotyrosine in response to cross-linking of CD3/CD28. In addition, the phosphorylation of ERK, a downstream event of TCR signaling, was reduced by the ROG transgene. We then compared the strength of TCR signals between C2KO and C2KO/TG Th cells. Cross-linking of CD3/CD28 substantially increased the overall level of phosphotyrosine in C2KO Th cells, whereas restoration of ROG expression substantially attenuated overall levels of phosphotyrosine and phospho-ERK in C2KO Th cells under activated conditions (Fig. 7⇓). Despite the differences in the levels of phosphoproteins, the overall levels of ZAP70 and p56lck, two upstream signaling molecules, were not affected by the ROG transgene (Fig. 7⇓ and data not shown). Attenuation of the TCR signals by the ROG transgene. Th cells of the indicated genotypes were harvested and left unstimulated or stimulated as described in Materials and Methods. Cytoplasmic extract was harvested and analyzed for the levels of phosphotyrosine and phospho-ERK. The levels of total ZAP70 protein were shown as loading controls. The positions of molecular mass markers are indicated. The data shown are representative of three independent experiments. Several NF-AT target genes in Th cells have been identified. These NF-AT target genes include cytokine genes, trans-activators (such as Egr2 and Egr3) (18), and CD40 ligand (19) and are responsible for effector functions and activation of Th cells. To the best of our knowledge, ROG is the first transcriptional repressor shown to be directly induced by NF-ATc2. The functional role of NF-ATc1 in regulating the induction of ROG remains unclear. Unfortunately, deficiency of NF-ATc1 results in an embryonic lethal phenotype and precludes an analysis of ROG expression in mature, NF-ATc1-deficient Th cells (9, 10). Previously, we have reported that overexpression of ROG inhibited the production of cytokines by both Th1 and Th2 clones (14). In this report we found that forced expression of ROG in wild-type, C2KO, or DKO Th cells did not affect the production of Th cytokines. This discrepancy may be explained by the fact that the total levels of ROG were only modestly augmented in both transgenic lines. The levels of ROG transgene, albeit sufficient to suppress proliferation, may not be high enough to inhibit cytokine production. The low level expression of the ROG transgene may also partly explain the observation that the antiproliferation effect of the ROG transgene on C2KO and DKO Th cells was less obvious when the cells were stimulated with higher doses of anti-CD3. Under such conditions, the strength of TCR signals may be sufficient to overcome the effect of the ROG transgene. Our data also uncover a novel negative feedback mechanism involving NF-ATc2 and ROG, which is critical in maintaining homeostasis of Th cells. During a Th immune response, signals generated from TCRs rapidly activate NF-AT proteins. The activated NF-AT proteins allow Th cells to mount appropriate immune responses, such as production of cytokines, and to enter the cell cycle. In addition, the activated NF-AT proteins, in particular NF-ATc2, induce ROG and very likely other transcriptional repressors to dampen TCR signals, thereby avoiding hyperproliferation and, possibly, overproduction of cytokines. This ROG-mediated negative feedback mechanism also provides an attractive explanation for the hyperproliferation seen in various NF-ATc2-deficient Th cells. As described in this report, NF-ATc2, but not NF-ATc3, is the main inducer of ROG. In the absence of NF-ATc2 (as in NF-ATc2, NF-ATc2/NF-ATc3, or NF-ATc1/NF-ATc2 deficiency), Th cells can still be activated by other NF-AT members, but are unable to fully up-regulate ROG to counteract activating signals. The unimpeded cycling of activated Th cells, therefore, results in hyperproliferation. The observation that restoration of ROG attenuated, but did not completely abrogate, hyperproliferation of C2KO Th cells also argues for the presence of additional negative feedback mechanisms. Recently, it was reported that deficiency of NF-ATc2 also resulted in dysregulation of CDK4 and several cyclin genes (20, 21). NF-ATc2, but not NF-ATc1 or NF-ATc3, indeed repressed the promoter of CDK4 via a critical NF-AT binding site, suggesting a direct repressor effect of NF-ATc2 on the CDK4 promoter. These reports along with ours firmly demonstrate that NF-ATc2 can initiate several negative feedback mechanisms, one of which is the induction of ROG. However, it is still unclear how NF-ATc2 represses the transcription of CDK4 and cyclin genes. One possible scenario is that NF-ATc2 may suppress the expression of CDK4 and cyclin genes via the induction of ROG. This scenario is in agreement with the observation that ROG is capable of binding to a DNA sequence similar to the binding sequence of promyelocytic leukemia zinc finger, also a poxviruses and zinc finger protein that regulates the transcription of cyclin A2 (22, 23). Therefore, ROG may inhibit cell proliferation by down-regulating cyclin A2 and possibly other cell cycle regulators in addition to attenuating TCR signals. In support of this hypothesis, forced expression of the human ROG homologue, Fanconi anemia zinc finger, in a myeloid cell line induced cell cycle arrest at the G1 phase, followed later by apoptosis (24). However, we have compared transcript levels of CDK4 and various cyclin genes between wild-type and transgenic Th cells by gene arrays and found no obvious difference (data not shown). The observation that forced expression of ROG attenuated TCR signals also concurs with a recent report showing that the threshold for activation in naive DKO Th cells is lower than that of control Th cells (17). How does ROG attenuate TCR signals? ROG is mainly located in the nucleus (24, 25). Therefore, it is unlikely, but not impossible, that ROG directly interacts with one of the TCR signaling molecules, most of which are cytoplasmic proteins. It is conceivable that ROG might directly or indirectly control the levels of one or several of the TCR signaling molecules. However, we found that overexpression of ROG did not affect the protein levels of p56lck and ZAP70, which are also normal in C2KO Th cells. Alternatively, ROG may up-regulate signaling repressors, such as phosphatases, and indirectly dampen TCR signaling. Identification of ROG target genes and studies of ROG-deficient mice, which are now underway, may provide answers to this question. We thank Dr. Laurie Glimcher for providing NF-AT-deficient mice and critical review of this manuscript, and Ingrid Dodge for her assistance with phosphotyrosine blotting. ↵1 This work is supported by National Institutes of Health Grant R01AI45653-01 and a grant from the Juvenile Diabetes Research Foundation. ↵2 S.-C.M. and B.Y.K. contributed equally to this work. ↵3 Current address: Institute of Immunology, National Taiwan University, College of Medicine, Taipei, Taiwan 10018, Republic of China. ↵5 Abbreviations used in this paper: CsA, cyclosporin A; C2KO, NF-ATc2 deficient; C3KO, NF-ATc3 deficient; C2KO/TG, NF-ATc2-deficient ROG transgenic; DHS, DNase I hypersensitivity site; DKO, NF-ATc2/NF-ATc3 double deficient; ERK, extracellular signal-regulated kinase; iono, ionomycin; ROG, repressor of GATA. Rao, A., C. Luo, P. G. Hogan. 1997. Transcription factors of the NFAT family: regulation and function. Annu. Rev. Immunol. 15:707. Hoey, T., Y. L. Sun, K. Williamson, X. Xu. 1995. Isolation of two new members of the NF-AT gene family and functional characterization of the NF-AT proteins. Immunity 2:461. Ranger, A. M., M. Oukka, J. Rengarajan, L. H. Glimcher. 1998. Inhibitory function of two NFAT family members in lymphoid homeostasis and Th2 development. Immunity 9:627. Garcia-Cozar, F. J., H. Okamura, J. F. Aramburu, K. T. Y. Shaw, L. Pelletier, R. Showalter, E. Villafranca, A. Rao. 1998. Two-site interaction of nuclear factor of activated T cells with activated calcineurin. J. Biol. Chem. 273:23877. Beals, C. R., N. A. Clipstone, S. N. Ho, G. R. Crabtree. 1997. Nuclear localization of NF-ATc by a calcineurin-dependent, cyclosporin-sensitive intramolecular interaction. Genes Dev. 11:824. Park, J., N. R. Yaseen, P. G. Hogan, A. Rao, S. Sharma. 1995. Phosphorylation of the transcription factor NFATp inhibits its DNA binding activity in cyclosporin A-treated human B and T cells. J. Biol. Chem. 270:20653. Shibasaki, F., E. R. Price, D. Milan, F. McKeon. 1996. Role of kinases and the phosphatase calcineurin in the nuclear shuttling of transcription factor NF-AT4. Nature 382:370. Timmerman, L. A., N. A. Clipstone, S. N. Ho, J. P. Northrop, G. R. Crabtree. 1996. Rapid shuttling of NF-AT in discrimination of Ca2+ signals and immunosuppression. Nature 383:837. Yoshida, H., H. Nishina, H. Takimoto, L. E. Marengere, A. C. Wakeham, D. Bouchard, Y. Y. Kong, T. Ohteki, A. Shahinian, M. Bachmann, et al 1998. The transcription factor NF-ATc1 regulates lymphocyte proliferation and Th2 cytokine production. Immunity 8:115. Ranger, A. M., M. R. Hodge, E. M. Gravallese, M. Oukka, L. Davidson, F. W. Alt, F. C. de la Brousse, T. Hoey, M. Grusby, L. H. Glimcher. 1998. Delayed lymphoid repopulation with defects in IL-4-driven responses produced by inactivation of NF-ATc. Immunity 8:125. Oukka, M., I. C. Ho, F. C. de la Brousse, T. Hoey, M. J. Grusby, L. H. Glimcher. 1998. The transcription factor NFAT4 is involved in the generation and survival of T cells. Immunity 9:295. Hodge, M. R., A. M. Ranger, F. Charles de la Brousse, T. Hoey, M. J. Grusby, L. H. Glimcher. 1996. Hyperproliferation and dysregulation of IL-4 expression in NF-ATp-deficient mice. Immunity 4:397. Xanthoudakis, S., J. P. Viola, K. T. Shaw, C. Luo, J. D. Wallace, P. T. Bozza, T. Curran, A. Rao. 1996. An enhanced immune response in mice lacking the transcription factor NFAT1. Science 272:892. Miaw, S. C., A. Choi, E. Yu, H. Kishikawa, I. C. Ho. 2000. ROG, repressor of GATA, regulates the expression of cytokine genes. Immunity 12:323. Ho, I. C., M. R. Hodge, J. W. Rooney, L. H. Glimcher. 1996. The proto-oncogene c-maf is responsible for tissue-specific expression of interleukin-4. Cell 85:973. Agarwal, S., O. Avni, A. Rao. 2000. Cell-type-restricted binding of the transcription factor NFAT to a distal IL-4 enhancer in vivo. Immunity 12:643. Rengarajan, J., B. Tang, L. H. Glimcher. 2002. NFATc2 and NFATc3 regulate TH2 differentiation and modulate TCR-responsiveness of naive TH cells. Nat. Immunol. 3:48. Rengarajan, J., P. R. Mittelstadt, H. W. Mages, A. J. Gerth, R. A. Kroczek, J. D. Ashwell, L. H. Glimcher. 2000. Sequential involvement of NFAT and Egr transcription factors in FasL regulation. Immunity 12:293. Tsytsykova, A. V., E. N. Tsitsikov, R. S. Geha. 1996. The CD40L promoter contains nuclear factor of activated T cells-binding motifs which require AP-1 binding for activation of transcription. J. Biol. Chem. 271:3763. Baksh, S., H. R. Widlund, A. A. Frazer-Abel, J. Du, S. Fosmire, D. E. Fisher, J. A. DeCaprio, J. F. Modiano, S. J. Burakoff. 2002. NFATc2-mediated repression of cyclin-dependent kinase 4 expression. Mol. Cell. 10:1071. Caetano, M. S., A. Vieira-de-Abreu, L. K. Teixeira, M. B. Werneck, M. A. Barcinski, J. P. Viola. 2002. NFATC2 transcription factor regulates cell cycle progression during lymphocyte activation: evidence of its involvement in the control of cyclin gene expression. FASEB J. 16:1940. Tang, C. J., C. K. Chuang, H. M. Hu, T. K. Tang. 2001. The zinc finger domain of Tzfp binds to the tbs motif located at the upstream flanking region of the Aie1 (aurora-C) kinase gene. J. Biol. Chem. 276:19631. Yeyati, P. L., R. Shaknovich, S. Boterashvili, J. Li, H. J. Ball, S. Waxman, K. Nason-Burchenal, E. Dmitrovsky, A. Zelent, J. D. Licht. 1999. Leukemia translocation protein PLZF inhibits cell growth and expression of cyclin A. Oncogene 18:925. Dai, M. S., N. Chevallier, S. Stone, M. C. Heinrich, M. McConnell, T. Reuter, H. E. Broxmeyer, J. D. Licht, L. Lu, M. E. Hoatlin. 2002. The effects of the Fanconi anemia zinc finger (FAZF) on cell cycle, apoptosis, and proliferation are differentiation stage-specific. J. Biol. Chem. 277:26327. Hoatlin, M. E., Y. Zhi, H. Ball, K. Silvey, A. Melnick, S. Stone, S. Arai, N. Hawe, G. Owen, A. Zelent, et al 1999. A novel BTB/POZ transcriptional repressor protein interacts with the Fanconi anemia group C protein and PLZF. Blood 94:3737.